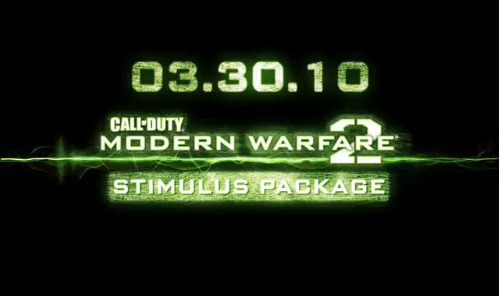 We told you yesterday about Modern Warfare 2’s first DLC called The Stimulus Package and since then there has been a ton of controversy surrounding its somewhat steep price of $15. With Modern Warfare already being one of the most successful entertainment releases of all time, many think the DLC should have been much less if not free, in order to thank the community that has helped make the game what it is. However, developers of the title, Infinity Ward, may not be who you want to be pointing the finger at. That is, since they are pointing the finger right back at publisher Activison. While talking to Kotaku, Community Manager for Infinity Ward, Robert Bowling said that, while he disagrees the DLC is overpriced, he also notes that Activision set the price fo rhte pack and not Infinity Ward. What do you think of the price of The Stimulus Package? Will you be picking it up when it hits your console of choice? I wish we could get together and boycott this crap but you know the kids are going to buy it right away, and prob 1/4 of your friends which will make you buy it in turn so you can still play with them. I hate saying that activision and infinityward have us by our coconutz but it seems that they have no respect for us and are going to do whatever they want, instead of listening to their fan base. Of course they’re going to charge money for something they spent days creating. Do you think the man hours put into creating these maps for us was just charity work? Sure, they will make a profit, but that’s what we, the consumer, should want for companies that make these games. If they don’t make money, you can’t expect them to put out ANY DLC or a sequel either. Besides, if you love playing the game, and are such a fan of the game; then you should be willing to put forward beer can money so you can waste a few more thousand hours with your buddies, noob tubing the ever living hell out of people. The fun to cash ratio here is astounding. I mean… sh!t… we could just play the same 5 maps over and over again… that might be nice… right? Well, if 2 of the maps are old, then they are already did the work and essentially i have already paid for them….and I would be willing to bet that (some if not all) of these maps were already developed and could have been included in the original release. And just because im a fan doesn’t mean that i should just throw out money if it’s not worth it. I don’t agree that they should be given out for free at all. Infinity Ward has brought you the most popular online shooter of all time, and has done a pretty good job of making it enjoyable for almost anybody, too. Activision and IW are both companies, and they exist to make a profit. They know people are going to buy this, no matter what the price. Yeah, maybe it would be nice if they put it a few dollars cheaper, but from a business point of view it would make no sense to do so. Personally, I’ll be buying this in an instant when it comes to Europe tomorrow. They had to reprogram the old maps to allow for the new mechanics system, new weapons and new killstreaks, so yes, they would have to put a lot of work into it. I mean no disrespect but some of you guys are no seeing the big picture here, as per the future of PC gaming. If your happy paying $60 for the game and an extra $15 for a bunch of copy-cat maps that we already played over n over till you get exhausted in previous CoDs well I can only see ignorance, boreness or just throwing ur money away, something that you are well entitle to do so if that is your wish. And for the guy that keeps on saying that he has lots of fun with this new maps, etc etc, well mate i can guess that u never played the original PC Call of Duties series otherwise you will be as dissapointed as all PC pro game players. In any case Im certenely not gona buy anything else coming from this bunch unless they make something playable for PC, with the usual dedicated servers, kick votes, etc etc etc all the usual and MINIMUM requirements to have a decent PC FPS multiplayer game. XboXish, PS3ish players very happy with it so keep on paying guys. And for the guy that he says that they had to put a lot of work and they should get paid for it,, rite 1.2 billion not enough? well give me a break or better a free DLC uh? hows that? after a 60 bucks overpriced game? thank you very much. Oh and wait another $15 for the next pack, ROFL, oh well say no more.